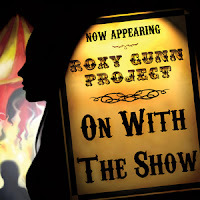 Howlin' Wolf Records: SIX STRINGS: The Roxy Gunn Project "On With The Show"
Info: The Roxy Gunn Project... is an eclectic, energetic rock band from Las Vegas, Nevada that is fronted by the soulful, warm voice of Roxy Gunn and backed up by a driving, edgy hard rock guitar sound. The Project’s goal is to share their music with as many people as possible and gain a solid world-wide fan base; show by show, song by song. Roxy Gunn Project songs deliver thoughtful, yet sassy lyrics and emotion-wrenching lead guitar work that can only be described as a rebirth of rock and roll in its purest form. The Roxy Gunn Project releases their debut album "On With The Show" on December 12th and I cannot tell you how thrilled I am to hear it. Each song brings you closer to the next one and all carries a rocking good time, you will not be disappointed. With a fresh sound with strong never boring trip, you will be pleased... It features a couple tracks from the film "Road To Hell", where not only do they provide songs... they are in the film. 5/5 My newest favorite band/group this year is definitely "The Roxy Gunn Project"... what is not to love about them? Do they... Rock, check... are they Awesome, check... New album out this week, check! Last thing.. check out the interview that did here at the "Howlin' Wolf"